Hi, my name is Jessie and I have chronic pain. I have had chronic pain since 2010 when I was involved in a vehicle collision that was no fault of my own. This caused me to have a laminectomy and discectomy at L4/L5. My surgeon had to take out more of the disc than expected and I am now living with a collapsing disc, left leg nerve damage, neck pain and general back pain everyday all day. I was also told I would eventually have to start getting fusions of my vertebrae, and would most likely end up with 6-7 of them. Plus to pour salt on the wound, I was told another baby was most likely out of the question. I could not return to my career as a HVAC technician for the work was too physical for my new body. I lost time with my 8 month old son. I lost time, communication and intimacy with my husband and put stress on our marriage. I spent 3 years in a lawsuit, attended a pain rehab, almost lost our house, lost friends, had to buy handicapped equipment for our home, now require a hot tub, and the 2 biggest life wrecking balls, lost my identity and the ability to do the things I once loved. I was also left with serious pain. I cried all the time for what I lost. I thought this must be what hell is like. I stayed in my pity party for 2 long years and suffered with PTSD. One day it hit me. Yes I had lost all those things but what did I gain? I gained a longer list of things than the list of things I lost. Through the hardest, most sorrowful, painful times one must ALWAYS find a ray of hope and happiness. If not you will literally create your own pitiful hell and that is an awful place to be. Do I still mourn over losing my old self? Well, yes, who wouldn’t? But do I want my old self back? No, never. I was not the incredible person I am today. I ended up with a new perspective on life and what living REALLY is. I was given a new temporary career as stay at home mom and by the way, I WAS able to have another baby in 2013. HVAC work is very demanding with long hours and now I was given a chance to be part of my kids life. My husband and I grew stronger and closer. I am 36 years old and this Summer my 3 year old son and I are going to be baptized together. I gained new wonderful friends (like Jen). Real friends who love me for being me, even when pain is high, and I am crabby. Since we are living on 1 income, I learned how to financially simplify our lives and my stress level is down. I know my kids and I are happier living without so many expensive gadget distractions and social media. We live in the country, the kids swing on the play set and get dirty helping me dig in the garden. I am a great cook now and grow 80% of our veggies I cook with at home. I found I can still do some things that I once did like hunting but just don’t snowmobile anymore and I am okay with that. I feel like a new person, one who cares and sees important things in my life but with pain and I love it. 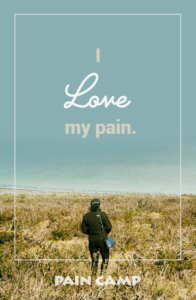 So yes in a round about way, I love my pain because without it, my new self today would not exist! Pain Camp is a safe place to share your thoughts, experience, strength, and hope. 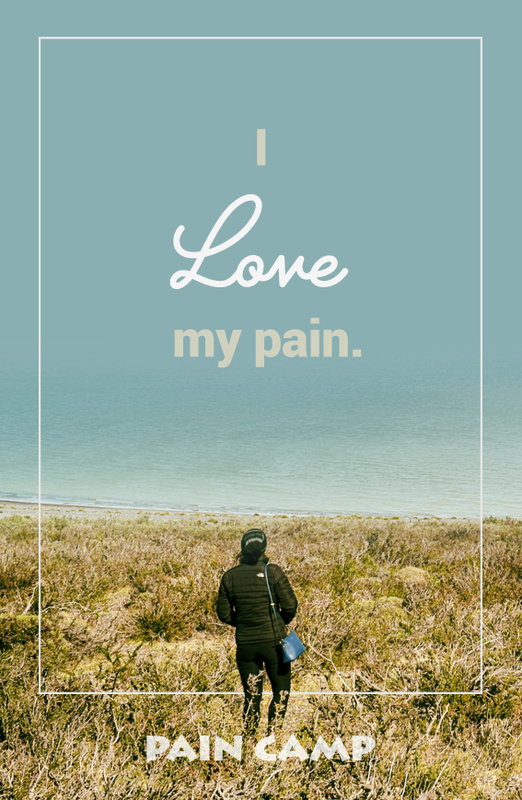 Do you love your pain? Love you Jess!! Your story is an inspiration to even those that don’t live with pain everyday. I am proud to call you a friend and sister!!! Thank you very much and I love you too. What courageous words you composed with your openness and eloquence in expressing yourself! I have been starting to learn more about mindfulness and your words made me think of one of the guiding principles of mindfulness which is Suffering = Pain x Resistence. Meaning that you will suffer more in life the more you resist pain. I think you’ve done that. Sure, you’re still in pain, but it sounds like you’re not resisting it anymore which means you’re not going to suffer. I can only imagine how much strength that took and still takes. Thank you Jen. You are correct! Not only did I make myself suffer mentally but physically my pain was much worse and healing was slower those 2 years that I wasted crying. I am glad you are learning about mindfulness. Life just seems easier and better with this understanding. Love you Cous.